The poor little guy! He’s being crushed by a big red bar! Someone needs to save him! It’s like the tense moment in Star Wars, when Han, Luke, Leia and Chewie are stuck in the trash compactor. Will 3PO and R2 save them in time? Does the Target logo have its own 3PO or R2? The problem I have is, I really see no reason for putting the logo under the bar like that. I might not dislike it so much, if I actually understood the reasoning behind it. Instead, I feel the way they have chosen to obscure the logo makes the overall design oppressive. The large red menu bar creates a heavy anchor at the top of the page, and by having it sit slightly over the logo, there is a feeling as if the bar is falling down the page. The white space above the bar and the text within it, make it seem as if that’s what’s pushing the bar down the page. Get rid of that, and the bar might float to the top, finally giving the logo some breathing room. 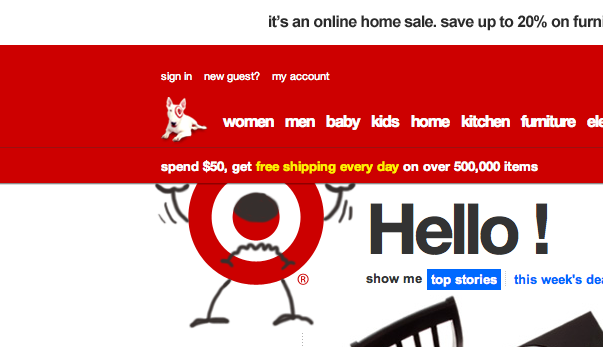 This design, however, shows that Target is confident enough in its brand identity to obscure their logo, and they have every right to be. 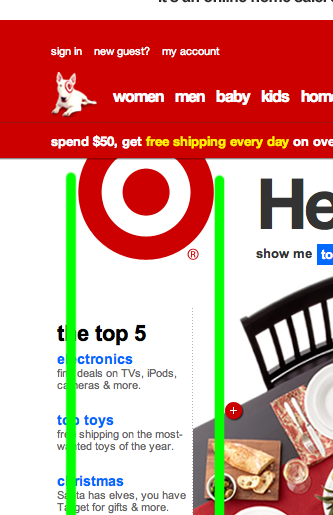 Target’s branding is usually spot on, and is identifiable by a large portion of people. I think at this point they could probably reduce the logo to a red dot, and people would still identity it with the brand. So, obscuring the logo perhaps is not a horrible thing, but as I stated before, I don’t understand the reasoning behind it. There is another reason I see for the instability. The logo doesn’t really line up with anything. My eye wants the logo to move to the left to align with the left side of the sidebar. It’s just ever so slightly off and makes it look like a mistake, instead of an actual design decision. It furthers my sense of instability and just makes me uncomfortable. The beauty of design, though, is its subjectiveness. My trash is someone else’s treasure. There is someone out there who absolutely loves this design, and totally gets it. Maybe that person can one day enlighten me.